That’s right… you are seeing the above image correctly. 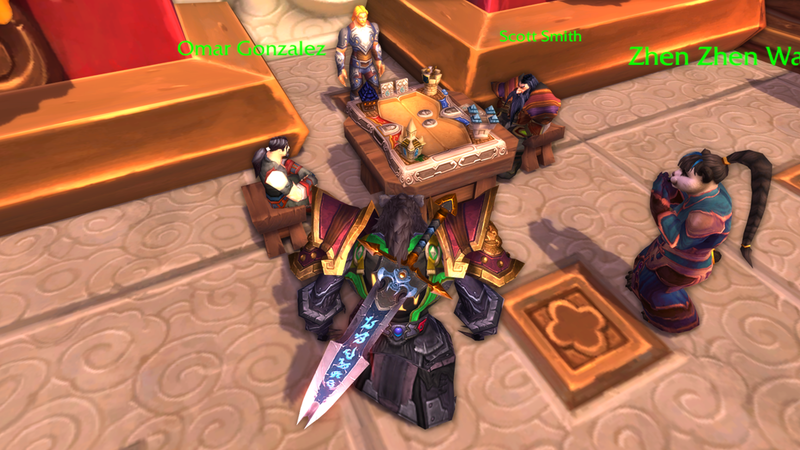 That is two in game npcs in World of Warcraft playing Hearthstone. The game that has caused such an upwelling of nostalgia… is being played in the game I am nostalgic about. I feel as though they are missing an amazing opportunity here however. If you could ACTUALLY play hearthstone inside of World of Warcraft, the same way you can play Legends of Norrath inside of Everquest 2… it would quickly become the ultimate piddling around waiting on someone experience. I can remember how amazingly popular the bejeweled and peggle became as pre-raid activities and those were just addons. It would be amazing if they wove hearthstone into every aspect of the game. Peggle loot was a thing that existed, and while it took forever it was an extremely fun way to settle loot disputes. Would be equally cool if you could do something like that with hearthstone. However that would also be a sure fire way to derail the gameplay, but still an enjoyable one. I guess the hearthstone game board feels all the more enjoyable… when you see it in a three dimensional table top version in the above screenshot. The fact that you are now seeing fresh World of Warcraft shots on my blog means that I lost the battle with nostalgia. I caved last night and renewed my account for a month so I could get in and satiate the urge to play that has been brought on by hearthstone. I go into this knowing full well that this decision almost always ends up in tears of frustration, but I felt like it was something I needed to “get out of my system” nonetheless. I have to say… once I got past the extreme awkwardness of seeing people I had not seen in years, that the overall gameplay was rather enjoyable. I spent some time piddling around Timeless Isle and managed to find a chest with some purple shoulders in it. Of course my friends immediately told me those were “not good”, but hell when I left the game I was still in blues. 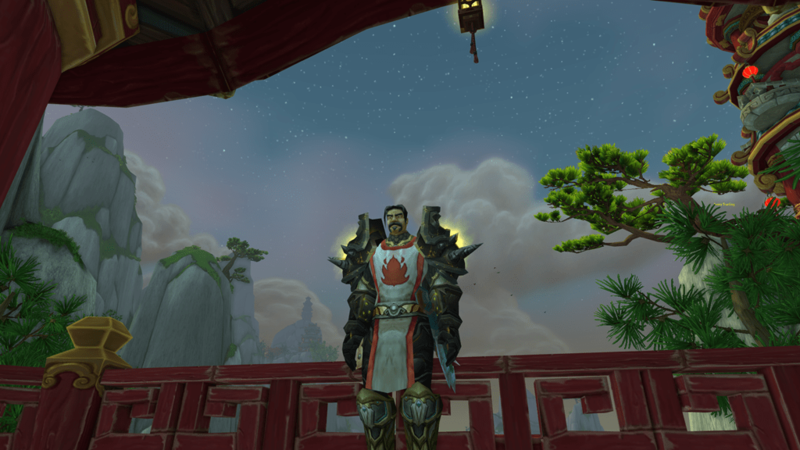 I did not manage to stick around for much raiding at all in Panda-land so anything I could get was a massive upgrade for me. I liked the concept of the timeless isle overall, the fact that you could get decent purple gear just by killing random stuff out in the world. Additionally apparently there are lots and lots of chest out there that have the random chance of dropping something that can turn into a piece of gear like I found. Similarly I had quite a bit of fun leveling Belghast. For whatever reason post Wrath, Belghast has not really seen any action. Right before the release of Panda-land I managed to push him up to 85 only to stable him again. For whatever reason it feels somehow wrong to have Belghast NOT be at the level cap for an expansion. Even though I pretty much transitioned to playing my Deathknight in Wrath, I would like to see him at least hit the cap here. The game is always enjoyable when I still have quests to do, but once that slows down I am sure I will get bored with it yet again and wander off in another direction. I know for certain that I am not back fully, because even if I end up landing for awhile… I will be gone once again when Elder Scrolls Online comes out. Right now every game that is not ESO is just a placeholder.